The Performance Shock keeps my feet supported when I travel to perform and teach! Your feet are the gateways from the Earth to your Soul, so it's a must to treat them with love and care! Whether I am traveling coast to coast with my dance convention, filming, coaching students, performing onstage, or choreographing, my long days take a major toll on my feet. I am so excited to share this innovative dance product with you, that has completely changed the game! 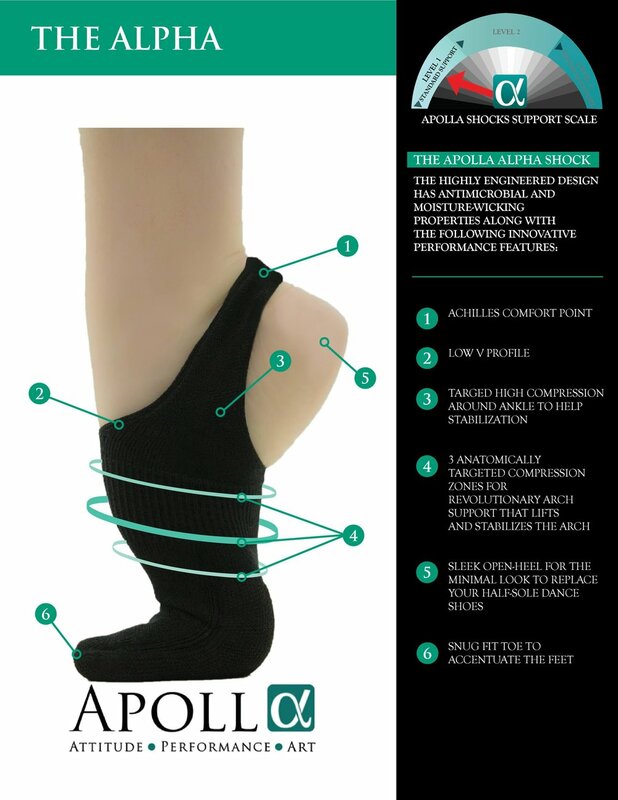 Apolla Performance Wear Shocks! They are so much more than dance socks, with incredibly smart design and functionality, my feet have never felt better! Read my review of each style, and grab my discount code at the end to save! I am very into reflexology, and truly believe that areas of our feet are connected by paths to our body, so I know by treating my feet well, my body feels well and I can be my best self! Decades of dancing in pointe shoes and La Duca heels, it is so luxurious to wear Apolla Shocks to teach, travel, and work contemporary ballet movement for new projects. I am going to break down my top 4 favorite styles, and why I love each of them! This is my favorite when I film my online ballet classes. They really hug and elongate the arch, creating a beautiful ballet line. Plus, I have always love the look of a stirrup, and I think this creates a really flattering look. It's a perfect amount of traction for both solid pirouettes and enough grounding to feel secure when taking off into a grand jete. To me this is so difficult to find, especially when some Marley floors can be slick. With these shocks I feel confident when filming and leading to really articulate the movement. I especially love these for my ballet students preparing their contemporary solos for YAGP. To me, it's a perfect product for contemporary and contemporary ballet. Where other shoes sometimes are too slick for acro and floor work, and barefoot does not allow confidence in multiple pirouettes, the Alpha Shock is the best of both worlds! Love the support in the arches! I love these for performing and teaching on my long convention weekends. Not only is this color tone truly lovely onstage under the lights, this is a solid performance enhancer, and really hugs not only my arches, but also my ankles. As someone who has had ankle injuries and scar tissue in my ankles, it's really incredible to have a functional sock give me support on those long tech days in the theatre, or 12+ hour teaching days. Almost acting as K Tape or ankle supporter, but aesthetically on point for what I would need onstage or teaching in front of 1200 kids! I would also highly recommend this for any student's contemporary performance, as these truly look excellent onstage! The traction is excellent, again creating a secure stance so I have no tension as I perform. The Infinite Shock is my go to for travel. Since I fly from LA often to the East Coast, I have long hours traveling and change of time zones. Often I finish teaching in the evening on a Thursday, and will drive immediately to LAX to catch a red eye so I arrive to the East Coast in the morning. When I fly, my lower legs and feet swell. With the Infinite Shock, there is enough support that they no longer feel achy and swollen when I touch down to Chicago or NY. They are Like big bear hugs that my calves and feet need to be my best self for a full weekend of dancing! They fit comfortable under my boots I wear to travel! These are also my go to wear when I work on my foot strength and the ballet barre. Because they do not have traction, I have a nice glide when doing slow tendus and working my metaltarchel strength and showing my students the detail of the footwork needed for ballet. Last but not least, the AMP! I love wearing these for convention teaching. I love these for teaching on convention, since often we are dancing on carpet in the hotel ballrooms. I love to get down on the floor with the students and demonstrate and do hands on correcting, so this shock without traction is the perfect compliment to those carpeted ballrooms. I also love this for when I judge dance conventions/competitions. While we teach heavy hours in the morning, we do sit for extended periods of time judging. I wear these under my Michael Kors wedge boots with a Show Me Your Mumu Maxi Dress or Jumpsuit, and I have a chic and elegant ensemble while keeping my feet secure and supported as they want to swell from teaching and rehearsing our faculty routines that morning. These are my favorite socks when I run on our neighborhood horse trails, wear in my shoes when I travel on long flights, take a Pure Barre Class, and especially when I teach Progressing Ballet Technique. PBT is a world renowned educational program I am certified in, and is specifically catered for ballet dancers for their strength and resilience through injury. I also love how Apolla labels for your Right or Left foot on the inside of the shock. Each one is unique for your specific foot! How cool is that? Apolla has incredible attention to detail, and that's why I am in love with their brand. Each one is incredibly shaped to your feet, so put on half way and peel the sock up (like a stocking). You won't believe the custom fit. I also love that the traction for the Apolla Shocks (which is patent pending) is not only invisible, it can be customized for your specific needs, using E6000 spray. You can wash, them line dry your shocks. I prefer to hand wash personally. Plus they are made in my home state of Texas! Whether a dancer, teacher, athlete, Pure Barre enthusiast or a mom always on the go, Apolla has a functional shock just for you! I love how there is a "Shock" (Shoe+ Sock) for every occasion I need. Using my hotel balcony as a ballet barre with my AMP Shocks! Filming Online Dance Class in my Alpha Shock!